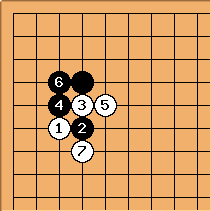 This is similar to the common tsuke-nobi joseki . 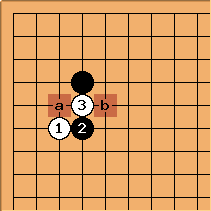 This is possible for White when she has a favourable ladder. Migeru: I think at b is Black's best option because White will want to play there next in any case. Vesa: Can someone please show, in which place white must have the ladder in this position? Thanks. MrTenuki: White must be able to catch in a ladder-- see 4-4 point low approach, attachment, wedge, low atari for more details.